Grace came with a very basic power system which had some major problems. Having completely redone the power system on Jammy, and wanting to have all the comforts of home, it was important to make sure the new system was well thought out and reliable. I chose to use MasterVolt as the primary charging, distribution and control system, Balmar for engine power management, and Firefly carbon foam batteries as the heart. This is the first in a series of posts on my power system upgrade which will cover design, install, and specific implementation challenges. Grace’s existing system consisted of a very basic battery charger that I knew would not keep up with my needs. The worst part was the two non marine-class starting batteries that powered everything – a total of about 140 amp hours if they were brand new, which they weren’t. They were starting-class batteries as well, which are not necessarily the greatest choice for a house battery load. The default factory battery switches allowed you to have one battery on, or both batteries in parallel for starting or other operations. I chose to modify this as well, as I did not intend on having a standalone starting battery given the weight and space it would use. After a lot of investigation, I chose to use MasterVolt as the core of the system responsible for charging, inverting, monitoring and distribution. On Jammy I used MasterVolt only for charging, and did most of my monitoring via Maretron NMEA 2000 devices (seen in the network diagram here) which were expensive, required somewhat complex installs, and were mostly independent. MasterVolt provides methods of doing this with a more integrated system using a network called MasterBus. The design of this system took me multiple months, and required ordering additional parts after initial install once I found limitations. I chose to do the design and install myself, when many would opt to pay a specialist. I had considered this, but knowing the markup that both the labor and parts get, I decided to use my pretty extensive electrical knowledge and do it myself to save money, and also to know it inside and out in case anything ever happened. I’m sure I didn’t do everything as perfectly as an ABYC certified installer, but I learned a lot about the system, and I feel it is far safer than the previous install. This gave me a completely redesigned AC and DC system with 300 amp hours of capacity, better quality charging both on shore power and while motoring, and complete visibility into the entire system at any point, even remotely via SignalK and iKommunicate. 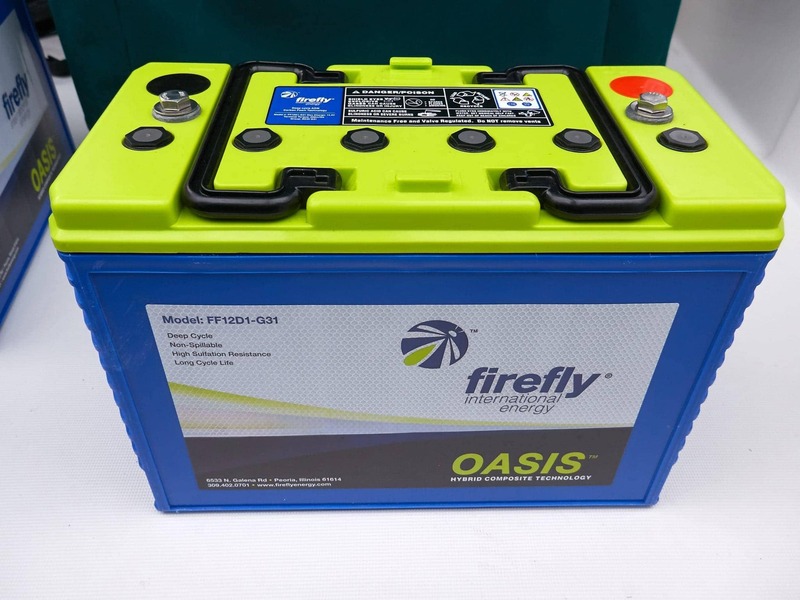 I chose Firefly Oasis Group 31 carbon foam AGM batteries, purchased locally here in Seattle from BRJ Solutions. There is some good information about these batteries on Bruce Schwab Energy Systems page, as well as this post, and this second follow up post on Panbo about Ben redoing his house battery bank. The biggest reason for choosing these batteries is their ability to be discharged so deeply without damaging effects. A traditional battery bank would only allow you to discharge them by 50%, while the Firefly can be discharged from 80-100%, and thrive on partial-state-of-charge (PSOC) environments like boats. This means that a 300 amp hour battery bank can actually use most of the 300 amp hours – not 150 in a traditional bank. The biggest drawback is the careful charging regimen these batteries require. If you decide to invest in these batteries, check carefully whether your existing charger can meet the very stringent requirements, or look into a very programmable one that you can control. I also chose to eliminate a dedicated starting battery, which was the original wiring setup. Having lots of good monitoring should prevent me from completely depleting the battery bank and still start the motor. If all else fails, I have a fully charged NOCO Genius Boost Sport GB20 400 Amp 12V UltraSafe Lithium Jump Starter always available to get things running again. If the batteries are the heart of the system, the MasterVolt Mass Combi Inverter/Charger is the brain. I choose the Mass Combi 12/2500-100. Those numbers indicate a 12v DC system, 2500 watts of inverter power, and 100 amps of battery charging capacity. That’s quite a bit to fit into a compact package only 19.5″ tall, 12.5″ wide, and 6″ deep – perfect for a sailboat of Grace’s size. I could write a whole set of posts on the capabilities of the inverter itself – it is fantastically configurable, and has a ton of useful features. Here are a few that helped me make my decision. Configurability – everything from the charging parameters to the way the inverter handles differing situations can be controlled by dip switches or software. The level of control over the charging parameters is one of the main reasons I chose this product. 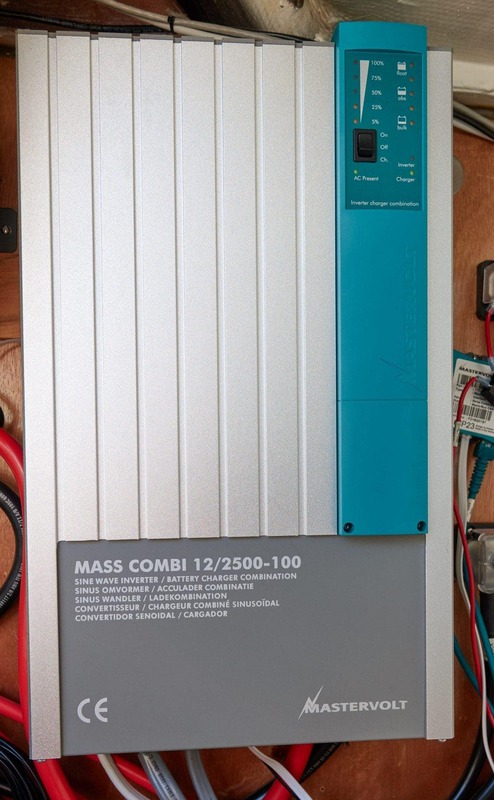 Charger – the charger in the Mass Combi is extremely powerful, capable of charging two banks simultaneously if needed. It can deliver 100 amps of charging, which with the Firefly batteries is great to get things back up quickly when on shore power. And as I mentioned above, it is extremely configurable to match the Firefly requirements. Pure Sine Wave – I am running a TV and charging computers and other sensitive devices, and insist on a pure sine wave inverter. Anything else is a risk to that equipment both in terms of quality and consistency. Dual AC outputs – the main AC power flows directly to the inverter, then splits out to two outbound connections. One is for inverted loads which can be on/off depending on the state of the inverter, and used regardless of shore power. 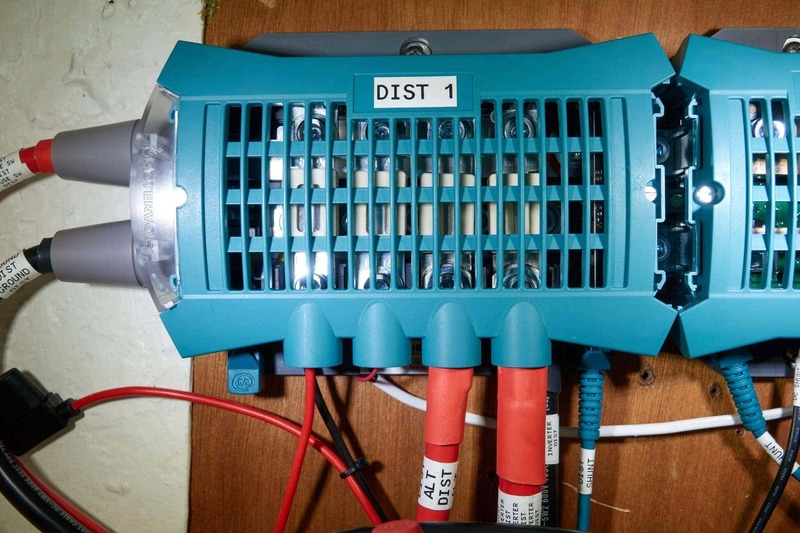 This connection has an overall amperage limit to prevent overloading the inverter. The secondary connection is for higher amperage loads that are not inverted, and only energized while connected to shore power. The whole setup switches automatically and can be configured in a number of ways. Power Sharing – this is a slick feature because of the way the AC wiring is setup. You can set an overall breaker size on the shore power connection, and the inverter will manage the amount of power flowing to the AC sources and the battery charger so that you don’t trip the shore power circuit. This was helpful this summer while running the vacuum and air conditioner – nothing tripped and the battery charger amperage varied to ensure that the shore power connection was stable. It can even be configured to pull power from the batteries if you have a situation where more power than what is provided via shore power is needed. MasterVolt has done a wonderful job of providing all of the configurability and tools to take advantage of their product, although I really wish they’d include a MasterBus connection natively on the device like all of their other products. Instead, you have to buy an interface that connects it via a serial link. There are a ton of other features which I haven’t mentioned including energy saving modes, parallel configurations and more. I’ll go into more detail on my specific install in later posts. Overall this is one of the most configurable pieces of power gear I’ve come across, not only in the marine world, but in my day job with computer data centers. 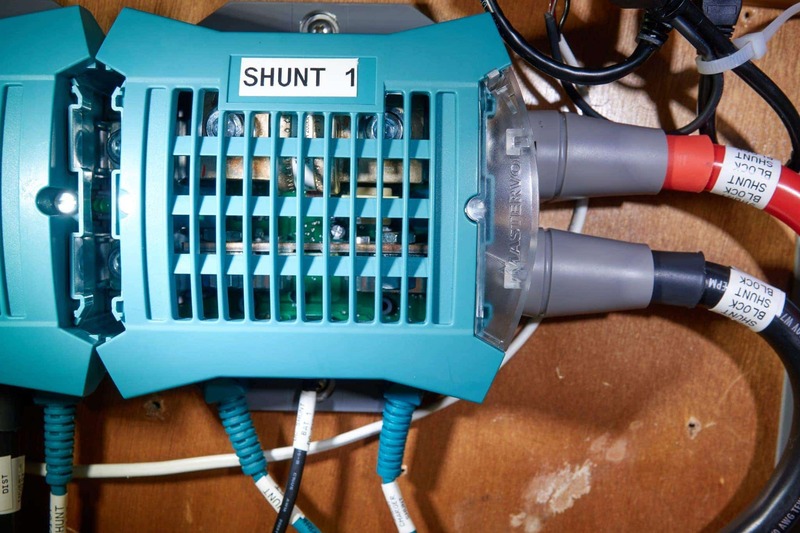 The shunt was critical in my design to allow for accurate power monitoring and management. 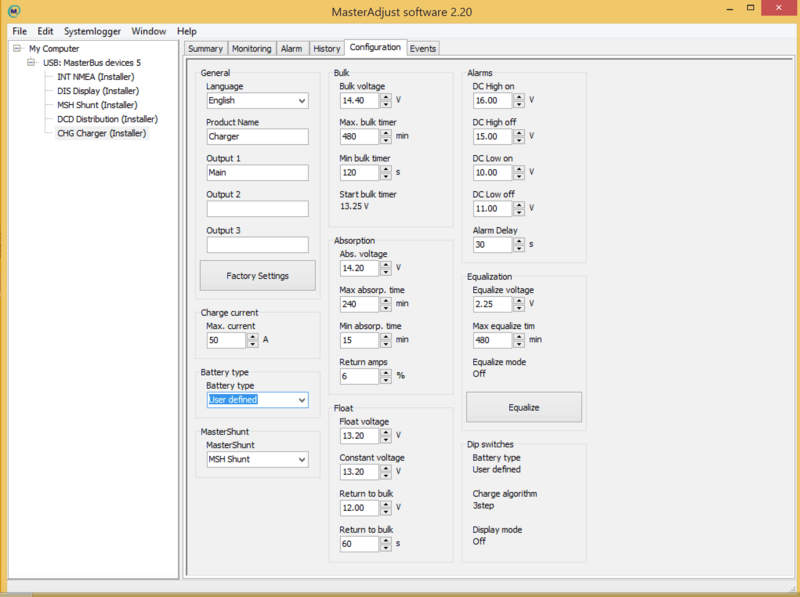 MasterVolt’s design allows it to clip into the DC distribution modularly and easily. 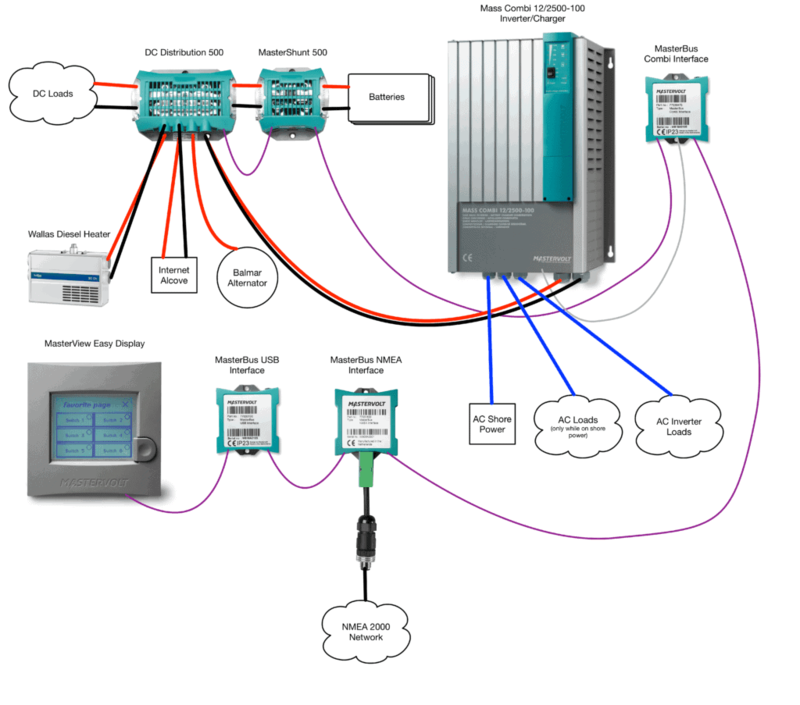 It connects to the MasterBus network, and shares accurate information about amperage flowing in/out of the batteries, calculates amp hours used, capacity, and monitors the batteries temperature via a sensor. 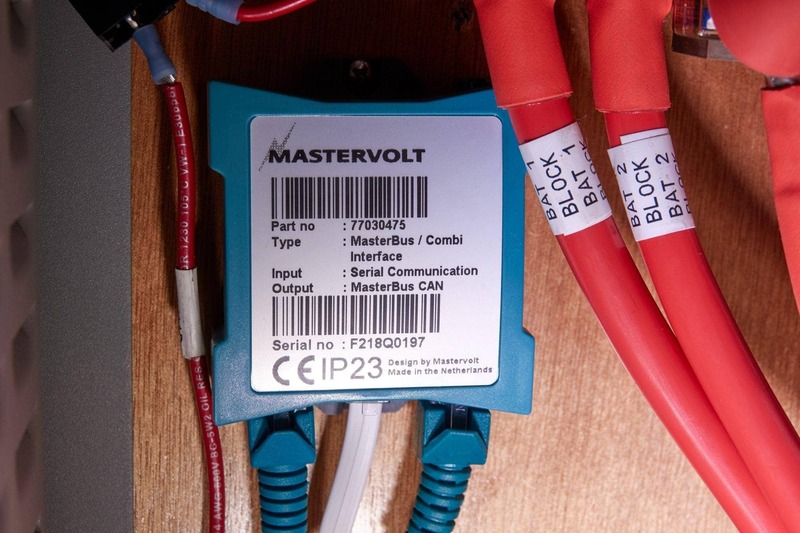 MasterVolt’s DC distribution allows you to have 4 DC sources connected and fused, along with alarms via the MasterBus network when one blows. In my case, I have the inverter/charger, Balmar alternator, Internet alcove, and Wallas heater connected to the four points. The inverter/charger can either draw power when inverting, or provide power back when charging. 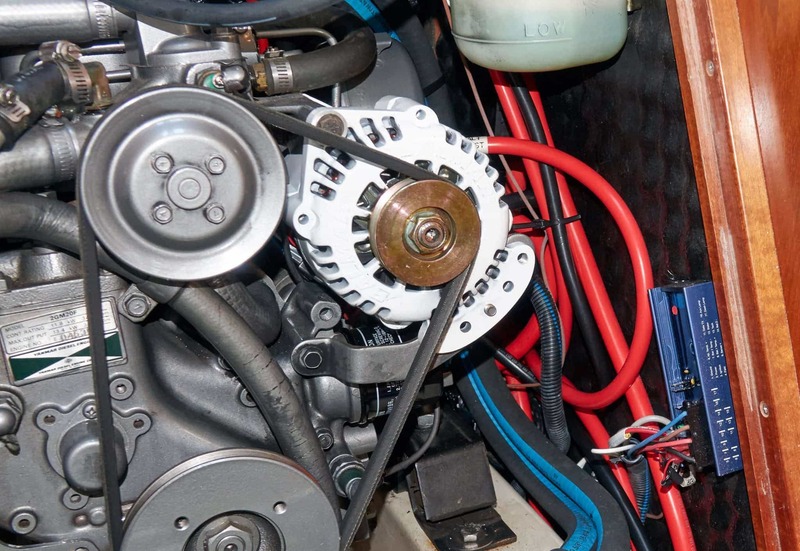 The alternator provides power into the battery bank when the engine is running. The internet and heater require connections that are not interrupted by a house bank being shut off. Alarms for any blown fuses show up on the MasterView display and on the NMEA 2000 network. A key part of my design is visibility and control. The MasterView display provides a quick way to see what is going on with the system, and deeper dives into each of the components to ensure a healthy system. Additionally, it allows for configuration of many important items very easily, such as turning the inverter on/off, changing the shore power breaker size, etc. Along the lines of the above, having all of the critical data on the network is important for monitoring from other places around the boat, and remotely. The MasterBus to NMEA 2000 interface provides this and allows for data to flow back and forth between the two networks. It allows you to configure particular MasterBus data bits to be sent out to the NMEA 2000 network so that devices like my Raymarine MFD and Maretron DSM150 can show critical bits of data wherever I am. The MasterBus to USB interface allows me to configure and monitor the entire MasterBus network and devices from a Windows PC. This was one of the pieces I added later after struggling to setup and configure MasterVolt devices via dip switches or the MasterView panel. The Mass Combi Interface is required if you want the inverter on the MasterBus network and to be monitored and configured remotely. I will delve into this more during the installation posts, but while MasterVolt is very configurable, it is extremely difficult for an average user to do themselves. There is very limited documentation on how to configure the deeper parameters, and many are confusing and require the trial and error. 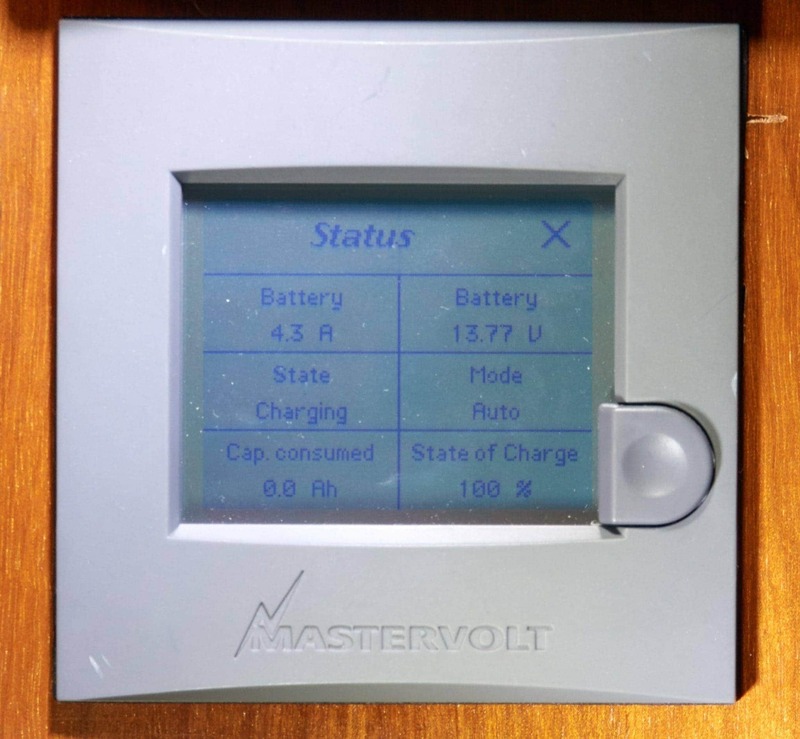 To make matters worse, while most things are configurable via the MasterView panel or dip switches, many key things are not, and require the MasterVolt to USB interface and a PC. In addition, many of these parameters aren’t configurable by an end user without an “installer” password for the MasterVolt PC software. I love that I can configure just about everything, but boy was it a lot of work to get it working just right! Keeping the batteries charged while out on the water was part of the design as well, and no one has as good of a reputation as Balmar for their alternator and regulator combinations. The factory alternator had a very simplistic regulator, and I didn’t want to risk it damaging my new batteries. It also was rated at 50 amps of output, but I had never measured more than 30 amps out of it no matter what I did, which would take a long time to charge my new bank. The new alternator is the largest I could put on my engine without changing wheels and belts and subjecting it to too much work, while providing 100 amps of charging capacity in a perfect world. The MC-614 regulator allows for very granular control over the alternator output to match the Firefly battery requirements. I go into more details in Charging away from the dock. While I love the visibility that the MasterView and MasterBus data gives me, its all from one vendor and could potentially have errors or report false information if configured wrong. 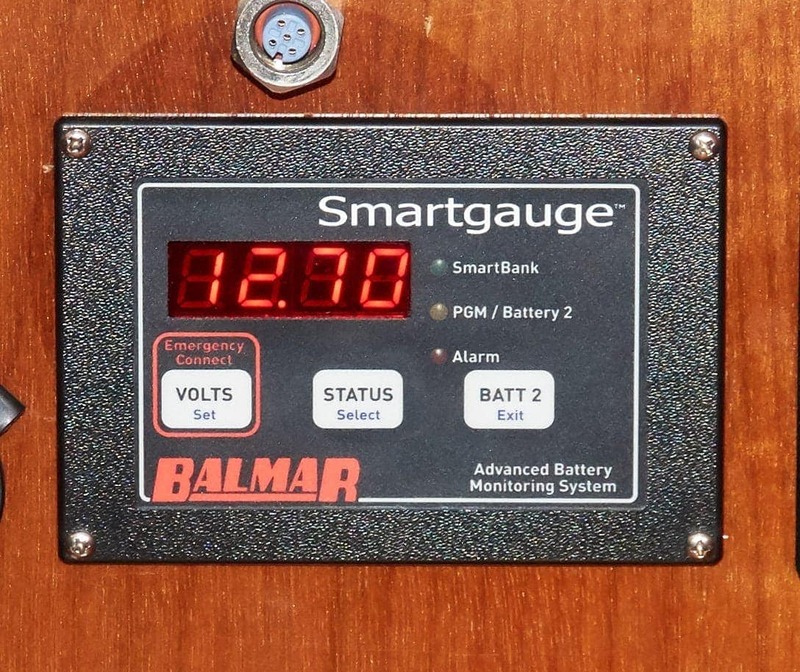 The Balmar SmartGauge is one of the best real-world battery capacity monitoring devices out there – RC has a fantastic write up and testing on his site. I wanted to have this in place as a backup way to monitor voltage and capacity, and it has proven to be very useful in diagnosing several configuration errors with MasterVolt. 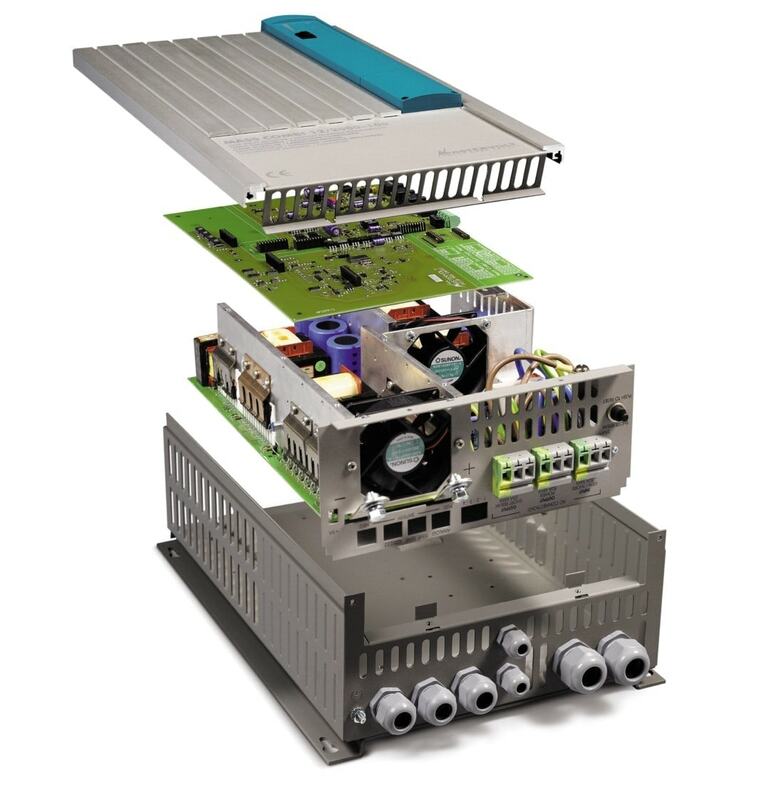 I wanted a very integrated and configurable system, while also being extremely reliable. So far I have gotten both of them with this MasterVolt-Firefly-Balmar combination. I’ve had a lot of trial and error in the implementation phase, which I will be writing about next in the hopes of helping others considering these technologies. You can read more about the installation and implementation at Power System Upgrade.